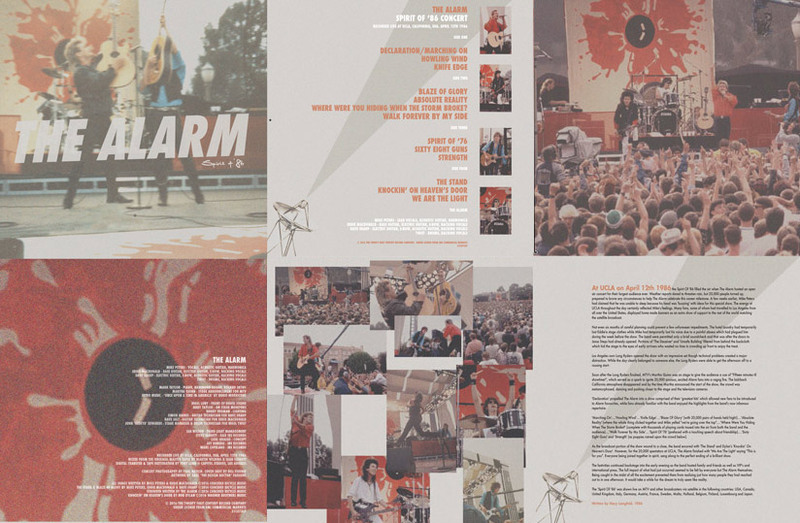 To mark the official 30th Anniversary of The Alarm’s historic ‘Spirit Of ’86’ concert that was broadcast around the world, The 21st Century Recording Company will be issuing a triplet of specially commissioned new releases from Saturday April 16th with an all new ‘Spirit Of ’86 – 30th Anniversary Collectors Edition’ DVD Digipak [Exclusive to www.thealarm.com]. 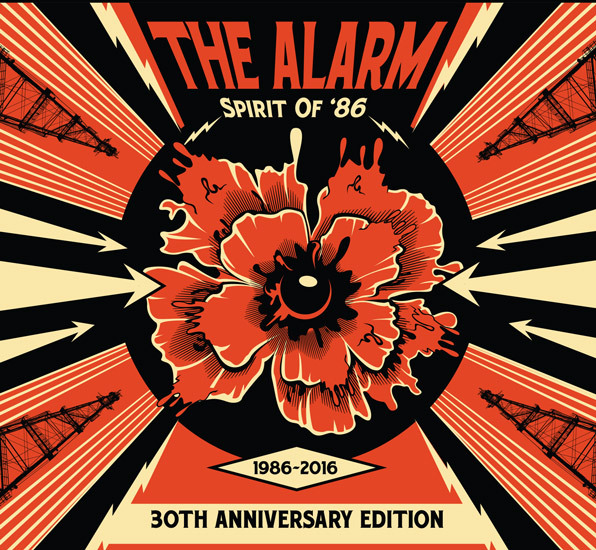 As the date also coincides with World Record Store Day 2016 on Saturday April 16th, 21st Century Records is also releasing (for the first time ever on vinyl), a brand new limited edition Double Vinyl LP – ‘The Alarm – Spirit Of ’86’ which will be available in record stores all over the world. The three disc DVD Digipak features a recently restored and remastered full length widescreen film version of the original MTV concert with 5:1 Surround Sound and Stereo Mix playback options orchestrated by Mike Peters from the original master tapes. 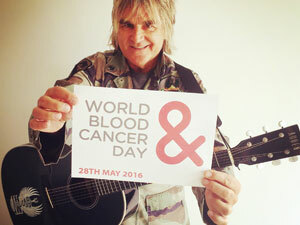 DVD special features also include a brand new behind the scenes documentary with Mike Peters that was especially recorded on the site of the original concert at UCLA, covering all the events surrounding the historic global satellite broadcast from April 12th 1986. The package also features an additional concert film of the legendary ‘Mike Peters presents The Alarm’ event filmed at The Beatles Cavern Club in Liverpool on April 16th 2015. Featuring a full representation of the original UCLA set list in a modern setting, Mike Peters closed the show with the entire audience singing the lyrics to ‘Spirit Of ’76’ underneath the mythic ‘Four Lads Who Shook The World’ Beatles memorial on Mathew Street. 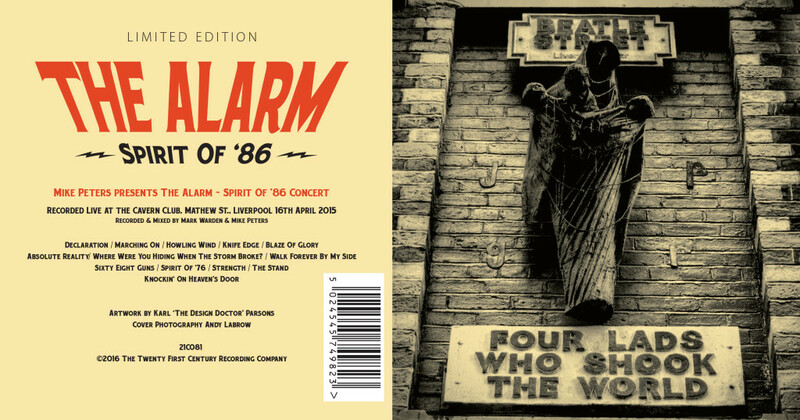 Other special features include ‘Behind the Music – ‘Spirit Of ’76’ with Mike Peters taking viewers / listeners on a journey from Wales to Liverpool and giving insight into the lyrics and meaning of this most special of Alarm songs. The first 500 copies of the 30th Anniversary Collectors Edition DVD and / or Spirit Of ’86 Vinyl / CD / DVD Bundle will also feature an additional ‘free’ bonus CD featuring the audio soundtrack to the Liverpool Cavern concert. 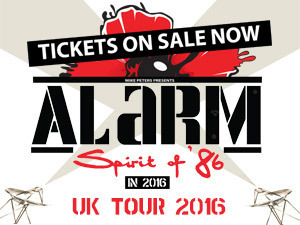 Spirit Of ’86 – 30th Anniversary Edition DVD / CD / LP is available for pre-sale in thealarm.com store now. Also available as a special offer ‘all in one’ price saving bundle. NB: All DVD’s are region free and playable anywhere in the world. 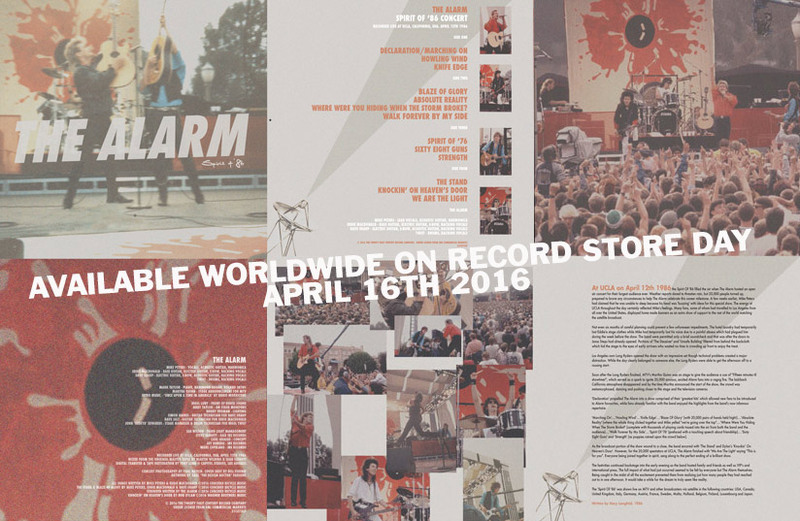 Take part in Record Store Day 2016 and order a copy of ‘The Alarm – Spirit Of ’86’ in advance at your local record store now. ‘Spirit Of ’86’ is released by 21st Century Records under the catalogue number 21C075LP and distributed worldwide by the Alliance Entertainment Group.